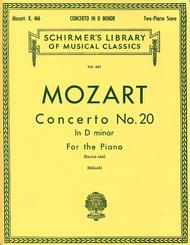 Piano Concerto No. 20 In D Minor, K. 466 (National Federation of Music Clubs 2014-2016 Selection Piano Duet). Composed by Wolfgang Amadeus Mozart (1756-1791). Edited by Theodor Kullak. For Piano, 2 Pianos, 4 Hands. Piano. Senior Class piece for the Piano Concerto event with the National Federation of Music Clubs (NFMC) Festivals Bulletin 2008-2009-2010. Classical Period. SMP Level 10 (Advanced); NFMC Level: Senior Class. Piano duet score (2 copies necessary for performance). Duet notation and introductory text. 64 pages. G. Schirmer #LB661. Published by G. Schirmer (HL.50255940).ISBN 0793569230. With duet notation and introductory text. Classical Period. 9x12 inches.Two Pianos, Four Hands. 2 Copies needed to perform. To see other NFMC selections, click here.About SMP Level 10 (Advanced)Very advanced level, very difficult note reading, frequent time signature changes, virtuosic level technical facility needed.